First off, this guy above is the truth. Second off, politics and local legislation is messy. Save Saratoga, the local organization fighting back on the state’s plans to build a casino in Saratoga Springs, is back at it, and wants your help. Remember weeks ago when they threw that benefit concert at Putnam Den with local celebrity Maryleigh Roohan and Bo Peep and The Funk Sheep? And they were supposedly successful in getting the necessary support to oppose the casino? Well, like I said, politics is messy and the state has thrown the burden back on the city to gain local support. Save Saratoga now wants your support, Skidmore students and alumni. They want you, as productive member of this community, to voice your opposition to the building of a casino. I mean, who wants to go to college in a gambling town? We’re already handing thousands of dollars over to the administration, so why give another excuse to throw money at The Man? 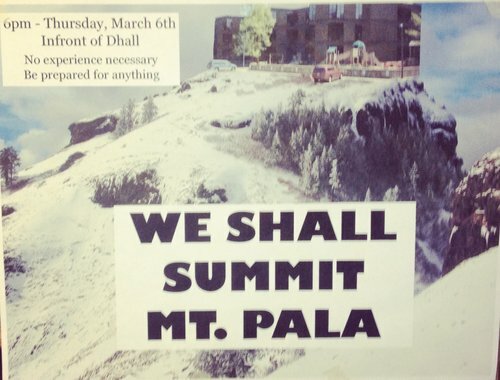 Seriously, We will be the first students ever to conquering PalaMountain! The last people to make it to the top and survive were Joseph C. and Anne T. Palamountain, obviously. If we’re missing something, let us know in the comments. So there’s been a lot of controversy around this town about plans to build a casino in downtown Saratoga. Save Saratoga is a “community-organized opposition group to the siting of a Las Vegas-style casino in the city of Saratoga Springs.” Save Saratoga doesn’t like casinos, they just like good music, and so, the nonprofit dedicating to maintain Saratoga’s thriving, artful, and old-time American small town vibes is putting on a show. 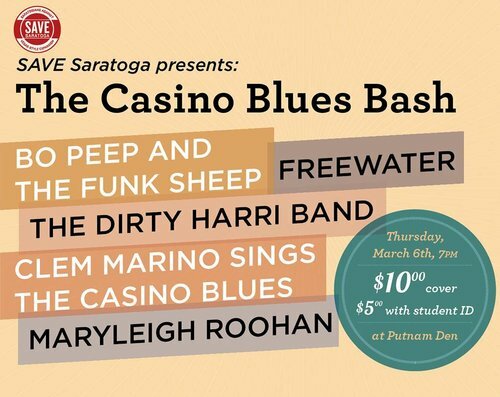 Cosigned by Putnam Den, Save Saratoga Presents five local bands, including Skidmore’s own Bo Peep and The Funk Sheep, as well as alum Maryleigh Roohan to perform in support of our community’s fight against the casino. The plan is to wear RED to show your support. And give money. And buy things.